The 2011 Proof Platinum Eagle continues a series of collectible coins from the United States Mint that started in 1997. The US Mint released the one ounce proof coin on May 26, 2011 for $2,092.00. Its maximum mintage was 15,000. United States Mint images of the 2011 Proof Platinum Eagle, with the obverse or heads side featuring the same traditional design but the reverse sporting the new theme. When originally launched, the 99.95% platinum proof was offered in four different sizes — a one ounce coin (which is still available), a 1/2 ounce coin, a 1/4 ounce coin and a 1/10 ounce coin, just like the similar bullion Platinum Eagles that are produced for investors. However, in late 2008, the United States Mint announced that the fractional sizes would be discontinued as part of a trimming of its product portfolio. It also discontinued the collectible Uncirculated Platinum Eagles. 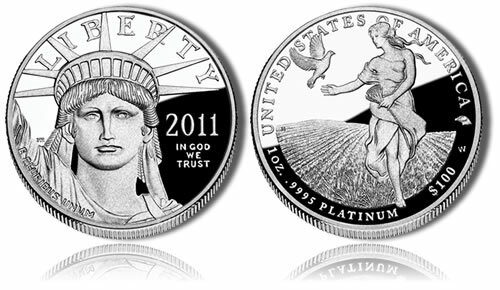 The obverse of each Platinum Eagle always contains United States Mint Chief Engraver John Mercanti’s image of Lady Liberty. "the Harvest goddess emerging from a field of wheat symbolizing the vastness of our Nation and its wide diversity of views." She bears a "stalk of wheat in her left hand, while extending her right hand to a landing dove, represents the fulfillment of tranquility in our Nation’s cohesive yet free society." Each coin features a legal tender face value of $100. However, the value of these strikes is elevated much higher by two factors. First, each is from one ounce of platinum giving it an intrinsic melt value approximately equal to the current market value of an ounce of the precious metal. Second, as a numismatic product of the US Mint, the coins have factors such as condition and rarity which elevate their value to other collectors.